Small dolls which have exchangeable hair and clothes. 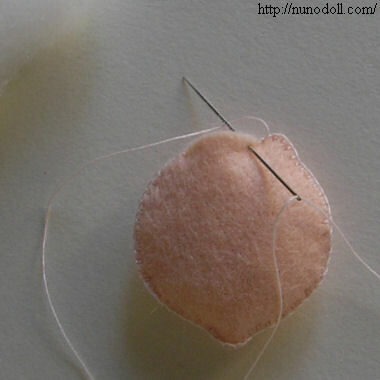 You don't need a sewing machine. Making is almost the same as mini cat. 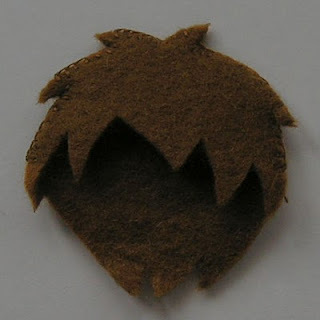 Materials are felt, polyester fiberfill, beads and threads. Sew beads for eyes. The mouth is embroidery thread. If you have interest, here are patterns. I hope you make clothes by your own design. I have enjoyed your blog for months now, and finally had to comment. Thank you so much for posting this pattern - it helps to solve a Christmas gift challenge this year! My 4-year-old daughter has requested a doll house for Christmas that does not exist in any store, so your most excellent patterns will help me grant that wish! I have used many of your patterns for my own children and other little friends, and they have been very fun and helpful. Thank you! Wow, these are darling! Perfect timing too. Thanks so much for sharing your adorable designs. I'll be linking. The dolls are adorable! Thank you so much for sharing your patterns. My daughter will love playing with these. Perfect stocking stuffers :) Thanks! GRACIAS POR COMPARTIR TU ARTE ERES GENEROSA ADEMAS TIENES UN BLOG PRECIOSO,BESOS DESDE ESPAÑA. Seu trabalho é lindo, obrigada por compartilhar essa jóia! Que Deus continue lhe abençoando. Gde abç, leíse. That fashion is the cutest doll for me. It looks so easy to make. I have a four year old daughter, if she sees this doll, I am sure that she cry out loud just to have it. This is amazing! I am going to go buy the fabric today. could you possibly put a pattern on your site for the kimono dress? it is adorable! can someone help me? I can find the clothes patterns but not the doll pattern itself for these dolls. Since I found your blog, I have enjoyed all your dolls & stuffed toys. In my opinion they are amazing. I wish that I will sew one of them in one day. 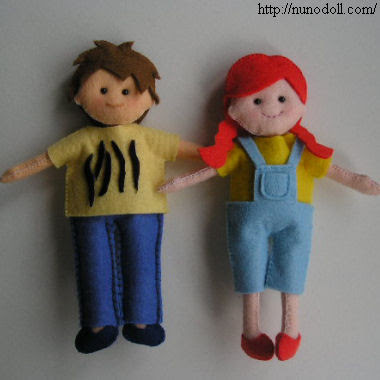 Today I share your blog and ofcourse your dolls in my blog page. -It is Turskish- I am sure that Turkish women , who reads my post, love them, too. I send you a big hug from there. These are a favorite doll at our house. I can barely sew the heads on before my daughters want to play with them. very nice pictures! I hope to see more updates on fashion from your blog. I love to see new and cool designs for teens. Thanks for sharing this information. I will surely share this with my friends. Your dolls are a delight. I have loved your designs for many years; made the Nekomimi doll and loved the way she turned out. I have added your blog to my 'favorites' on my own blog. Thank you so much for all your generosity. I am praying for all of the people of Japan. Thank you for the tutorial! I'm going to try to make these for my son! It is super cute! i really like it,you are amazinly good in this! congratulations from Argentina. existe alguna forma de traducir la pagina??? nice dolls, thanks for sharing pattern and tutorial. I love the fashion dolls but I can't seem to find the pattern to print out. Please help! I love your blog! Thank you for sharing your doll and animal designs. I am making the rabbit now. thanks for sharing, they´re awsome! i came to your site accidentally. love to visit your site for future reference. Thank you for sharing this. I have used your pattern to make many kinds of dolls - from teenage witches to funny little elves. I made the ears bigger and embroidered decorations on them. THANK YOU for putting this pattern on the internet for seniors like me (and others) to enjoy!! I made the dolls and had so much fun making them. Thanks for sharing your pattern. 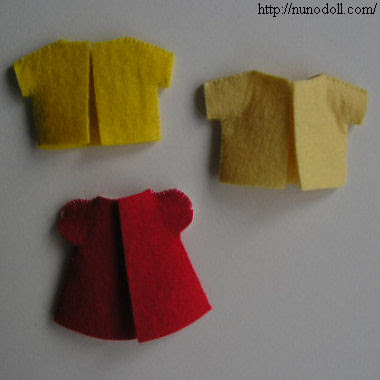 I made a lotvof felt clothes also. So cool to see that the interest in your fabulous dolls, patterns and tutorials are still just as relevant today as they were when you first posted this amazing article way back in 2009 I think it was (correct me if I'm wrong). You're one of the VERY few doll makers who's actually prepared to give away this valuable information without some type of catch attached !! Good for you. It's certainly earned my vote of approval and I intend to become an avid follower. 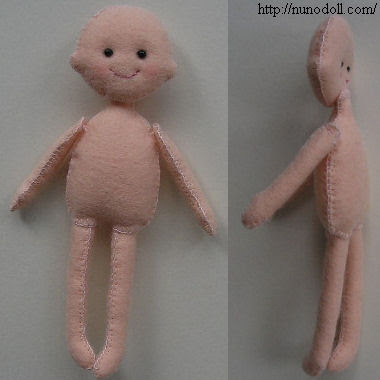 You can't imagine how long it's taken me- trawling through the web- to find a 'Good' doll maker who explains clearly the processes required to produce one of these 'art forms'- they're definitely not just dolls !! You have a definite skill that I imagine will take me many, many hours of practice before I can produce anything remotely similar to one of your masterpieces- I'm prepared to stick at it though. Now that I've found you I don't intend to waste any more time dabbling and I'll start following your advice and further posts with the aim of one day becoming a proficient "Doll Maker" !!!' Luv it !! Hi Runo! I'm a huge fan of your dolls, every since I was a child, and now I'm the process of making you red riding hood doll but with a twist! I would love to send you a picture. 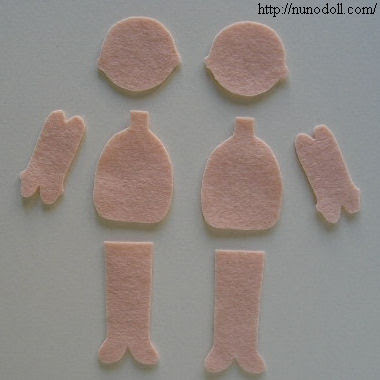 However, I noticed that one popular felt doll pattern on youtube seems to be very similar to the one on this post! https://www.youtube.com/watch?v=fukq5q7kgTE Do check it out to verify ;). 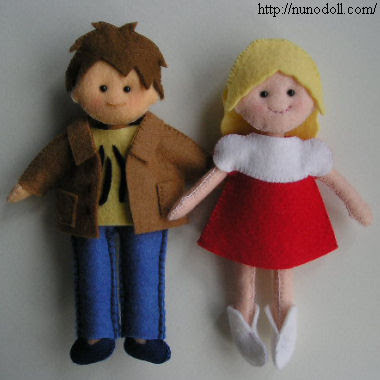 Now i understand how to make a doll like that..thank for sharing..
Hi Runo, Your felt dolls are darling. Thank you for sharing your doll patterns. I put a small length of pipe cleaner in each leg and arm for more stability. Again thank you so much for the shared patterns. You are amazingly talented. My name is Runo, not Nuno. "Nuno" means cloth or fabric. I make dolls, clothes and underwear of various nuno. If you have a question, please read this page.